Singapore is a haven for Asian furniture, with many shops of varying size - especially in the Dempsey Hill and Bukit Timah neighbourhoods. 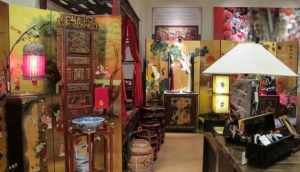 Most outlets offer such treasures as graceful Chinese cabinets, lamps, frames and dining sets. Be prepared to shop around and check out several of the rather cosy, boutique-style shops; you'll ordinarily find them stuffed with a huge variety of both small and large items. If you can't find what you are looking for, most shops also offer custom-making services. Custom-built items may take some time to complete, but you'll be sure to have exactly what you need for your tastes and living environment.Shops will also see to your shipping needs, helping you find the best carrier for your newly-acquired items. They have many years of import and export experience, and are happy to share it with you.